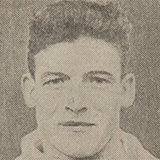 Patsy joined United from Raith Rovers and remained at Tannadice for two seasons. He was a regular in the side that won the Second Division title in 1928-29. Less frequently used in the following season, he was released in April 1930. Patsy was born on this date in Perth. United got back to winning ways following two straight defeats with a narrow win over Dunfermline Athletic. The Tannadice men were facing into a strong sun during the first half, yet they began in good style, scoring less than ten minutes into the opening stages through Jacky Kay, who lashed the ball home with a first time shot following a splendidly placed ball from Geordie Henderson. Duncan Hutchison was unlucky not to extend United's lead in the moments that followed. Dunfermline came back into things and some resolute defending from the home side was required to keep the goal and ultimately see the first half out with the lead.